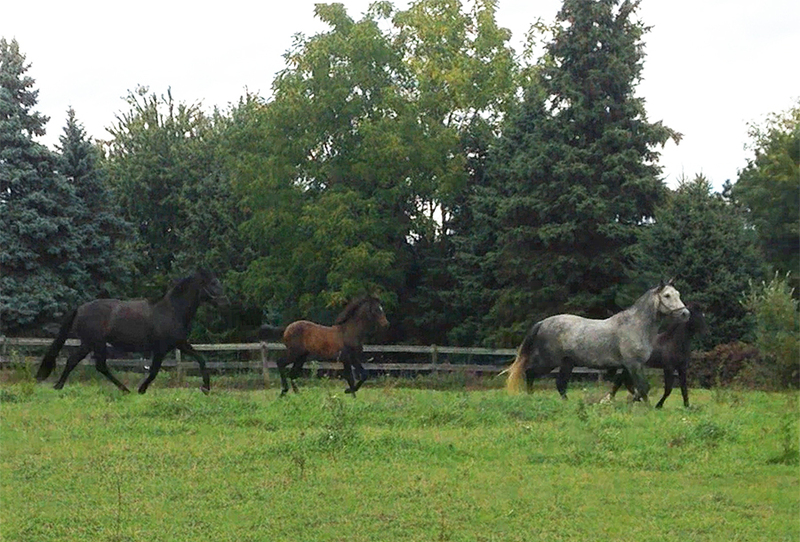 As important as our stallions, our broodmares are selected for movement, temperament and conformation. Breeding proven stallions to mares with athletic ability, enables Avalon Farms to produce purebred Andalusians suitable for open competition in any sporthorse discipline. Like a star walking on to the stage, Diva KG struts into the pasture and then sprints off with glee. This filly is clearly going to be a star, a center of attention. Diva is a black bay PRE Andalusian inscribed into Spain’s studbook through ANCCE. Her sire is Favorito KG, the 16.3h athletic powerhouse, while her dam is the beautiful, talented Ilusion de la Parra. Diva is an example of the movement, intelligence and overall brilliance that Favorito KG is producing. Diva’s grandsires on both sides were National Champions. Diva is the granddaughter of dressage National Champion and High Point Winner, Favorito de la Parra (XLVIII) and the 1993 National Halter Champion, Boticario de la Parra. Like her sire, Favorito KG, Diva is tall, and talented. She learns quickly and retains what she learns. Diva appears to have all the makings of a terrific performance horse/show mare (hence her name). Ilusion was a beautiful grey 1992 PRE Andalusian mare bred by the Parras of San Antonio. She was sired by the 1993 National Champion Senior Stallion, Boticario de la Parra. Her dam, Quisquillosa II, was a black mare bred by Francisco Lazo Diaz (“Paco” Lazo), and imported to the United States by the Parra family. Ilusion had powerful, straight movement with a Spanish lift. She was an intelligent, kind, alpha mare and a terrific riding horse when not in foal. Ilusion amazed us with her offspring – all of whom have incredible movement and great “working” temperaments. Her offspring make terrific performance horses and are prepotent when bred, passing their beauty and ability.